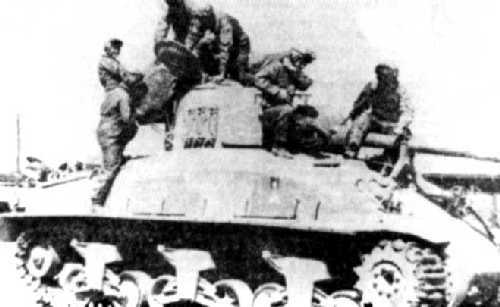 The USA supplied 30 Sherman tanks to Chile after the signature of the Rio Treaty of 1947. A further 46 were subsequently acquired from commercial sources. These Shermans were reactivated for service on the early seventies and then languished until they finally disappeared in the very early eighties. A total of 48 Shermans arrived in 1947-1948. They were assigned to 3 regiments, one in the city of Iquique, another in Antofagasta and a third in Santiago. The picture on the left shows an M4A1E9 in Antofagasta in 1948. This Sherman is a rebuilt & modernised example, typical for the type of Sherman the USA sent to friendly nations after WW2. In 1990 the total Sherman strength was listed as 150, made up by ex-Israeli M50s and M51s. Possibly the shipments originally included M32 TRVs as well. 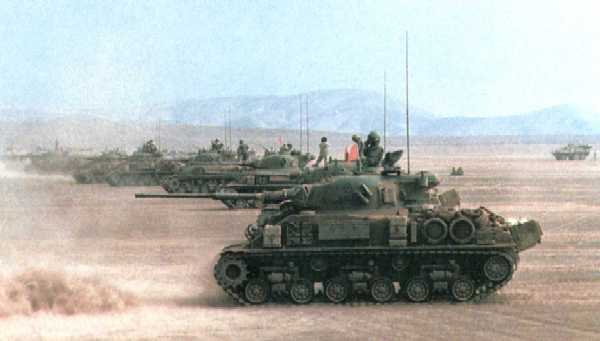 Even though the Chilean Army bought hundreds of Leopard 1 and AMX-30B2 tanks in the late 1990s, the Shermans are not to be phased out of service until the year 2002. 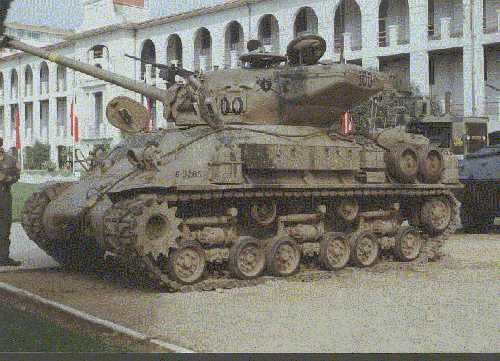 The M51 Shermans were acquired from Israel in 1979. They arrived with a .50 cal ranging MG over the 105mm main gun. These were removed upon arrival, but from 1980 until 1986 they were reinstated. The photo on the left was taken in September 1992 at Maipo regiment in Valparaiso harbour. It shows the CO's vehicle of the first squadron of Cavalry School's demo group. The shield clearly identifies the unit, with the breast plate and crossed lances bearing an "E". 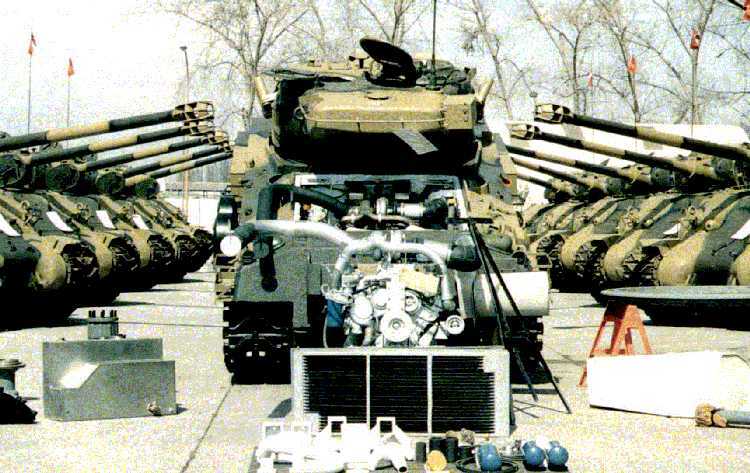 Between late 1994 to February 1998 the Chilean Army's War Material Service fully overhauled and modified 100 M51s. Transmission, suspension and optic systems were renovated, and the co-axial machine-gun was eliminated. The picture shows the delivery of the first 12 units in February 1995. Note the two tone camouflage scheme. The sand colour is much more yellow than the original overall Israeli sand colour. Also note that several of these M51s are based on large hatch welded hulls. Armament: French 105 mm D1504 L/44 (improved). Engine: Detroit Diesel 8V-71T diesel engine (replacing the Cummins VT8-460 diesel). Read more about this variant in The Chilean Army and the IMI 60mm HVM gun by Fernando L Wilson at the Sentinel site. In 1983 Chile acquired a number of M50s from Israel as well. By mid-1984, they had arrived without their 75 mm guns. The M50s were fitted with a 60 mm gun by the Chilean national arms industry at Fuerte Arteaga. This modification was developed by NIMDA Co. Ltd. of Tel Aviv, Israel. Although as many as fifty to sixty-five M50s were acquired, forty-eight are now on strength. They have a prominent engine exhaust on the rear deck. Armament: Israeli Military Industries 60 mm Hyper-Velocity Medium Support weapon (HVMS 60) quick-firing gun (replacing the French 75 mm CN 75-50 gun) with a modern fire-control system. The gun is fitted in a new mantlet and new ammunition racks are fitted. Engine: Cummins VT8-460 diesel coupled to the original transmission. With this engine a speed of 41 km/h and range of 420 km is attainable. Shown on the left is a M32B1 TRV. 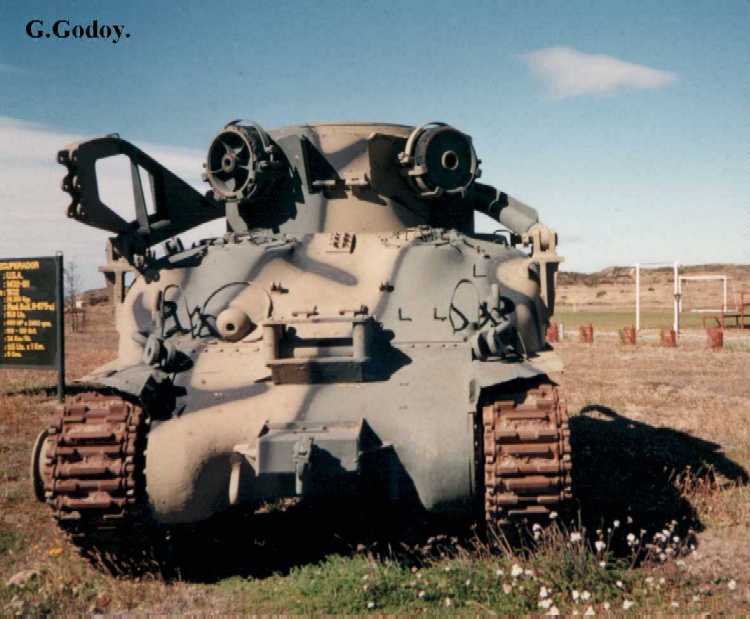 In 1990 it was put on display at the "Dragones" Regiment museum, Punta Arenas, Chile. The nickname "Panchote" for the TRV originates from the name of the wrecker cars of the Chilean railways. The TRV's boom reminded the crews, which originally served on the railroad battalion, of the appearance of the lattice cranes. English, Adrian J., Armed Forces of Latin America. London: Jane's Publishing Co.Ltd., 1984. Gonzalo Godoy, Roberto Paredes, Fernando Wilson. Loon, Wim van, 'Nieuwe carriere voor versleten oorlogsveteranen'. Transmobiel, No.44, April 1992, p.34-35. World Defence Almanac: the balance of military power. Vol.XVII, Issue 1, 1993. Military Technology 1992-93, p.46, 48.